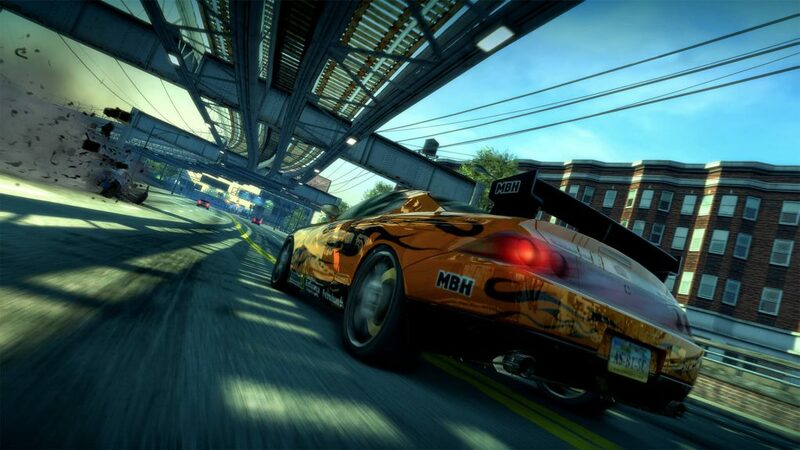 Once one of the most popular racing series around, especially after its excellent third outing, Burnout resides in the top few rungs of the genre. Ditching any pretence of simulation, and reveling in total, pure arcade goodness, Burnout is fast and furious racing that anyone can pick up and have fun with. This is one of the reason’s I’ve always liked Burnout. 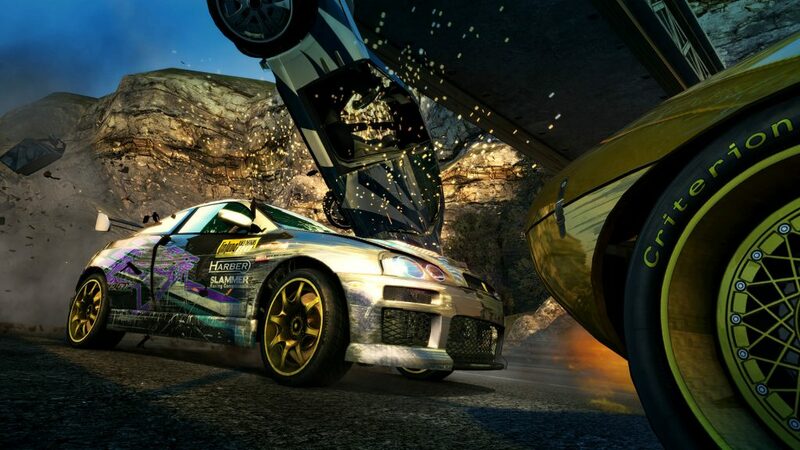 Although simulation games can be fun, as someone who’s not ‘into’ cars, I’ve always preferred the instant gratification of the arcade racer, such as Motorstorm, Need For Speed, Wipeout, and yes, Burnout. 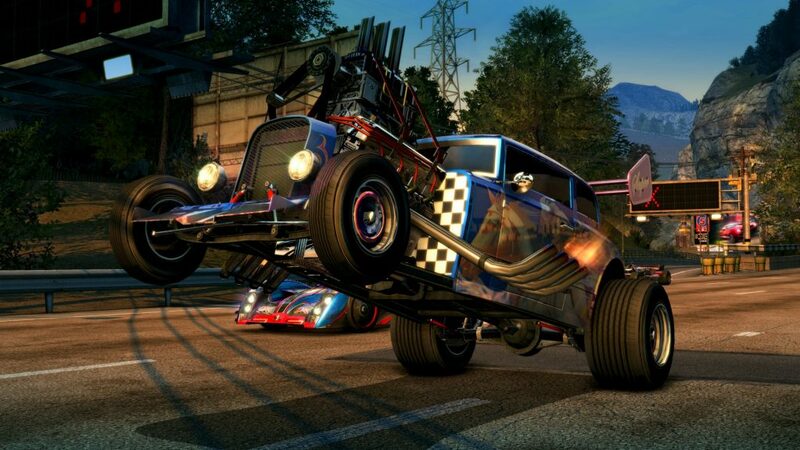 Although it’s no Motorstorm, Burnout is a prime example of easy to pick up and enjoy racing, and Paradise City is a pure distillation of that. Although it’s an open world-style racer, it’s not bogged down with fluff, and is all about the racing, and because of that, it’s great. Cars going fast is indeed the bread and butter of racing games. Starting out with a simple junker of a car, you are thrown into the city with one goal, win. You cruise around the city finding events, and with a quick press of R1 and R2, you’re away, on one of several events. There are races, takedown challenges, marked man missions, and more. All are simple, and all are just plain fun. There are no pre-made routes for races, only a goal to reach, and the game only assists by flashing up recommended turns as you approach. Depending of the style of event you can race your way to glory using pure driving skill, or you can batter the opposition, ramming them into walls or oncoming traffic, or utilise a mixture of both. All dangerous and skillful driving builds up your Burnout meter, and using this you can engage your nitrous to speed ahead, or use it to turn your car into a more effective battering ram. There are different classes of cars you can earn (mainly by ramming them off the road when they appear in the city), and each handles differently and makes use of Burnout meters in different ways. Speed cars, for example, require the Burnout meter to be full before you can use it, but if you do, and you use it all, you can earn another full meter instantly. Stunt cars handle better for stunts (surprisingly), and use the meter to make this easier, whilst aggression cars are built for taking down foes, and are heavier, handle more slowly, but pack a punch. And that’s about as complex as Paradise gets, which is great, as complexity isn’t needed here. Instead, the game piles in masses of events, tons of cars, and a killer soundtrack. From the time you fire the game up, until you turn it off, it’s wall to wall racing, with nary a menu in sight, and is perfect for a frantic stress reliever to wind down. The series isn’t known for its realism. Of course, if you’ve already played the original release, you’ll know this, and as this is a remaster, you’re probably wondering what’s different. The quick answer is, not much. The game does look nicer, granted, with 4K support, but in truth, it’s not a massive jump from the last gen original. It runs smoother, loading times are shorter, and the game has every DLC pack already included, but in terms of new content, there’s nothing here. It’s the same game as the original release. This isn’t a bad thing, as the original game was great, and it still is today. It’s showed few, if any signs of ageing, and having all of the extra content, including Big Surf Island, Cops and Robbers online mode, Bikes, and the Ghostbusters hearse, and the Back to the Future-themed car, all in once package is great value, especially for first time players. Burnout Paradise Remastered is one of those remasters that had very little effort put into it, and is the same game with a lick of ultra HD paint poured over it. However, in this case, this isn't a downside, as the core game is still every bit an enjoyable as it once was, and now is the perfect time to sample it if you've never played it, or missed out on the DLC the first time around.